The Andover 48-inch vanity was built with quality and beauty in mind. It was constructed of zero-emissions solid oak hardwood aimed at reducing environmental impact, preventing warping and lasting for years. A high-quality 12-step hand-finishing process was used on the wood to ensure stunning and trouble-free looks and performance. This antique black bathroom vanity has a marble top in Carrara white and a white sink for a seamless look. It also has a matching black mirror with a timeless design. This vanity has both an all-around look and a classic style. The white marble counter and black solid wood base make this piece great for any bathroom. The roomy double-door cabinet is great at storing your bathroom must-haves. Put a classic feel in your bathroom with this good-looking set from Wyndham Collection. Andover 48-inch Vanity in Antique Black with Marble Vanity Top in Carrera White and Mirror The Andover 48-inch vanity was built with quality and beauty in mind. It was constructed of zero-emissions solid oak hardwood aimed at reducing environmental impact, preventing warping and lasting for years. A high-quality 12-step hand-finishing process was used on the wood to ensure stunning and trouble-free looks and performance. This antique black bathroom vanity has a marble top in Carrara white and a white sink for a seamless look. It also has a matching black mirror with a timeless design. 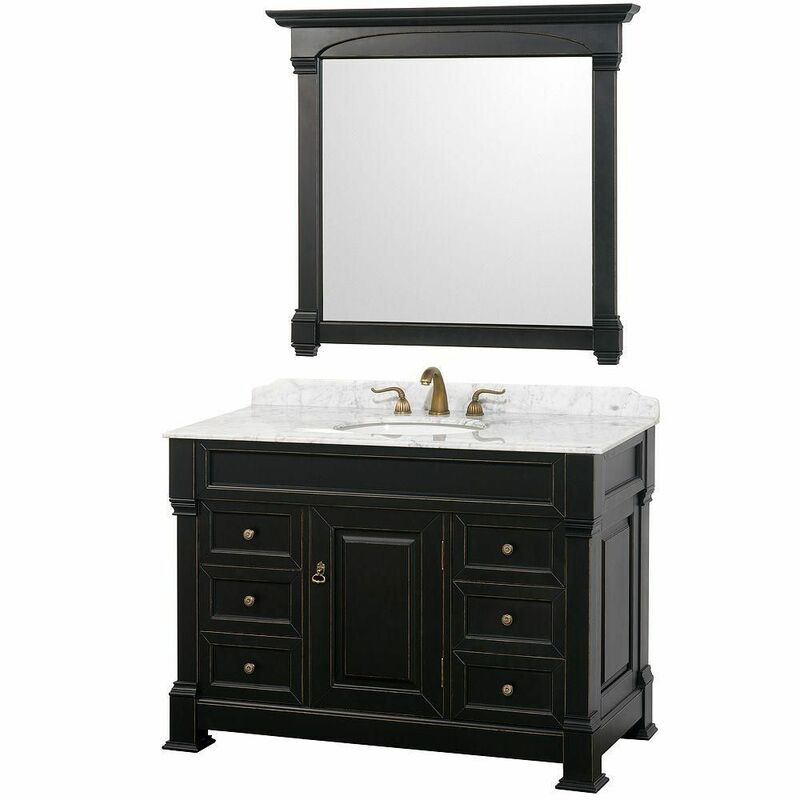 Andover 48-inch Vanity in Antique Black with Marble Vanity Top in Carrera White and Mirror is rated 4.5 out of 5 by 31.